I have lived in Town and Country Manor in Phoenix for over 15 years, and there is a renewal underway here for the second time. The Town and Country Manor subdivision a.k.a the Rancho Ventura Neighborhood is located between 40th & 44th St; Thomas and McDowell Road. We are a pocket of 63 postwar ranch homes and the first in a series of four known Town and Country neighborhoods that Ralph Haver AIA designed for developer Fred Woodward. 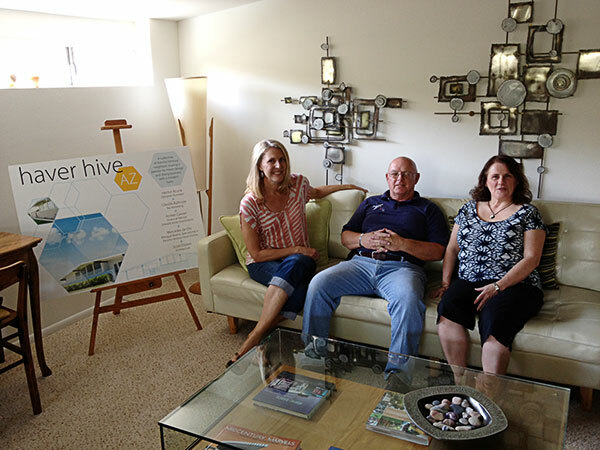 In 2006, when we learned that we were a Haver neighborhood, we named ourselves the "Haver Hive" in order to distinguish ourselves from the larger RVNA Association. Back in 1997 I accepted a job in downtown Phoenix. I quickly tired of commuting from north Scottsdale every day, so we started looking for a home close to downtown that was affordable and full of character. We fell in love with the architectural lines of this 50s ranch, with its clerestory windows and simple floor plan. It was conveniently located 10 minutes from downtown Phoenix, Tempe and Scottsdale, and minutes away from major expressways and the airport. The area was definitely a bit rough around the edges, surrounded by low-end apartment complexes and commercial businesses. The homes were "anti-trend" at the time—small bedrooms and closets, no garage, no community gates, tight lots and a mixture of neighbors from various ethnic backgrounds—but we were drawn to it and bought our first home. Almost immediately there were "urban" issues to deal with. People parked multiple cars on the street because often several families where living under one roof. 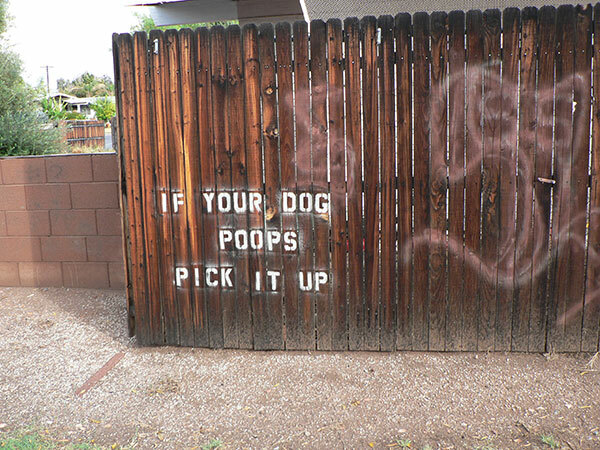 Trash, graffiti, abandoned grocery carts, and dog poop were indicators of different cultures and value systems. Admittedly, I was not well versed in building community or being neighborly. Instead of talking to my neighbors or the Rancho Ventura association about it directly, I took matters into my own hands and called the City hotlines. I tried the city services route for several years with mixed results. I also sent out a few letters asking neighbors to pull together but it didn’t work because we barely knew each other. So my husband and I focused on what we could change; we made major design upgrades, improved the yard and dealt with his cancer and death—all the while feeling isolated from the rest of our community except for my neighbor Bob. He stepped in and took care of my cats and watched my house for long periods of time when Oliver and I went through his cancer treatment in LA. Bob was dependable and caring. He anchored a real sense of what it means to be a great neighbor. 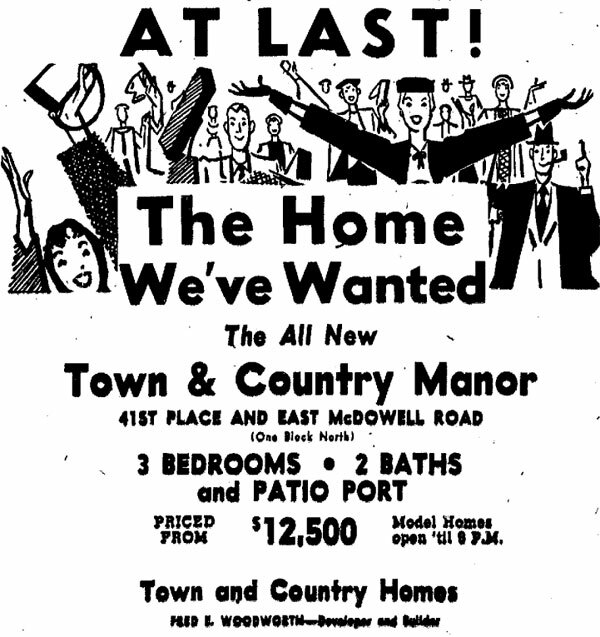 By 2006 real estate values in the neighborhood had gone up significantly citywide, and we learned that Town and Country Manor was not just a Ralph Haver designed subdivision, but the first of the entire Town and Country series! This was very exciting news since the area was not really known or promoted as a “Haverhood”. 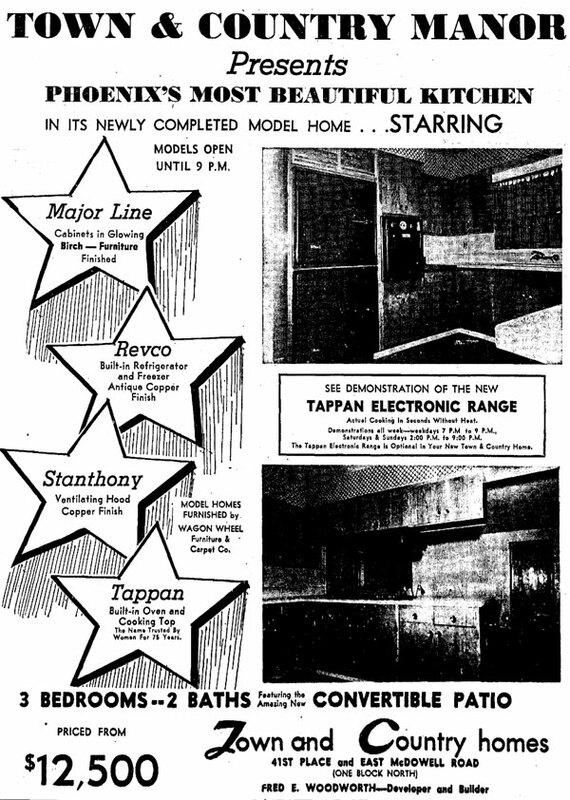 One of the original birch kitchen layouts so proudly advertised in the 1950s era ads. 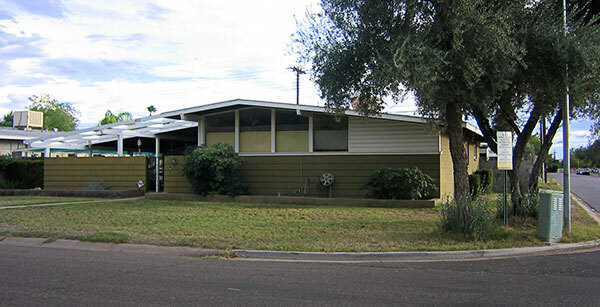 Thanks to The Modern Phoenix Neighborhood Network, magazines like Desert Living andDwell, and a resurgence of interest in midcentury modern design nationwide, people's interest in Phoenix’s midcentury heritage grew. We began to see artists, young couples, and families who loved midcentury design come into the neighborhood and tastefully renovate their homes. Our neighborhood was one of the last affordable areas left to buy modern design during the bubble, and especially the rare Haver Homes that often ended in bidding wars. 2006 marked our first real wave of resurgence. 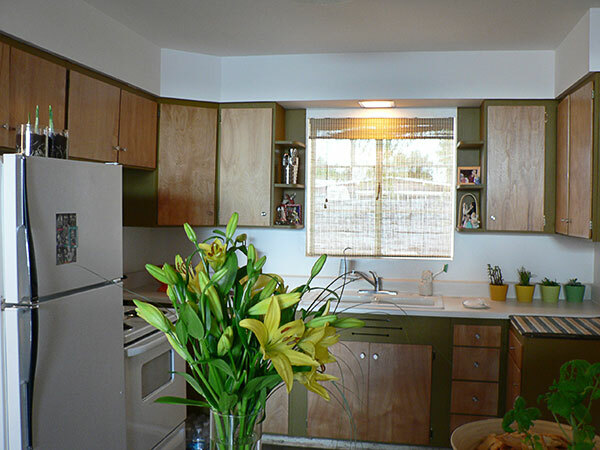 Inspired by this wave, I took a leap of faith in 2007 and undertook a major “green” kitchen remodel. 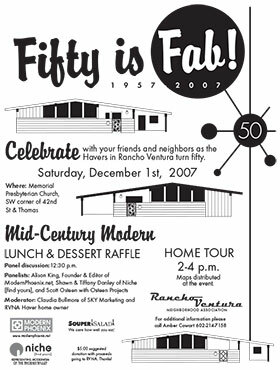 I wanted to share my excitement and approached Mercedes de Oro, a bilingual realtor living on my street, to help me organize a "Fifty is Fab" event to celebrate the 50th birthday of our neighborhood. 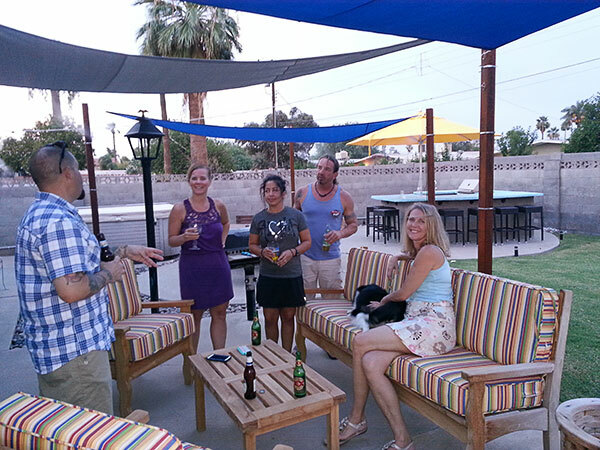 Together, we organized a panel discussion featuring Alison King of Modern Phoenix, Shawn and Tiffany Danley of Niche (find yours) realty, and Scott Osteen, a young architect who moved into the neighborhood a few years prior. I moderated the discussion, asking these experts their view on the unique aspects of living in a Haver home from a design, real estate and lifestyle/community perspective. Our home tour featured 6 homes, and dozens of people showed up despite the rain shower! 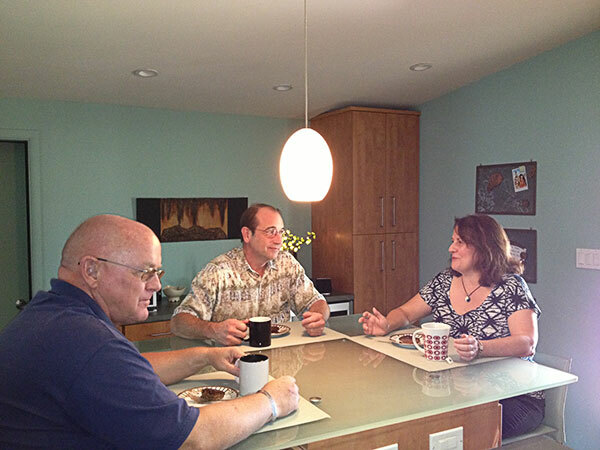 Our neighbors—some who had never met each other before that day—poked around in each other’s houses and got inspired by the individual interpretations of living within the Haver footprint. Some homes stayed true to the original spirit, while others did very contemporary renovations. 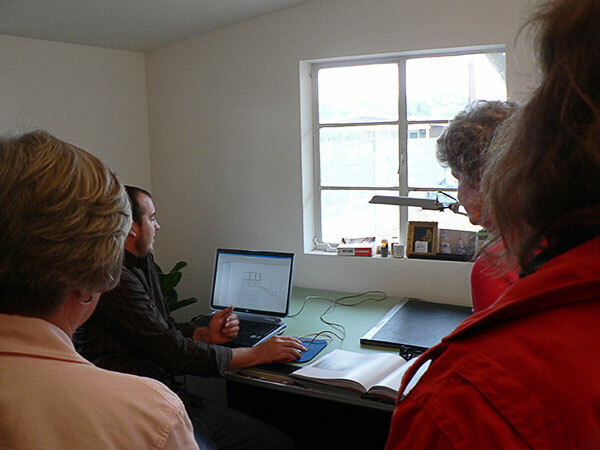 Architect Scott Osteen showed his CAD plans for an expansion of his Haver Home to a small crowd on the tour. Neighbors got to know each other for the first time on the home tour. With common floorplans come common problems. 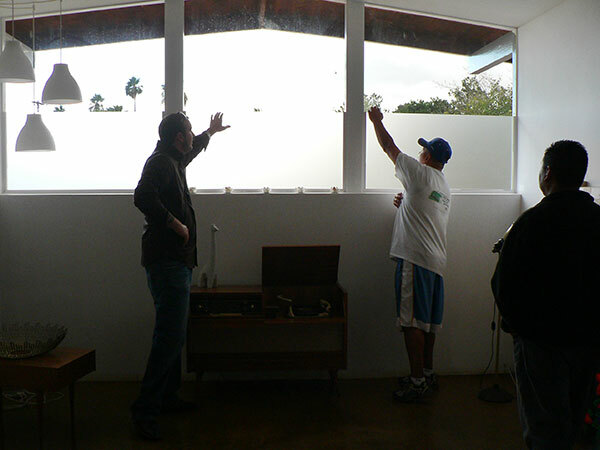 Here neighbors discuss how to address privacy needs while letting in light through the front windows. Adhesive film available at home improvement stores diffuses the light and obscures the view. 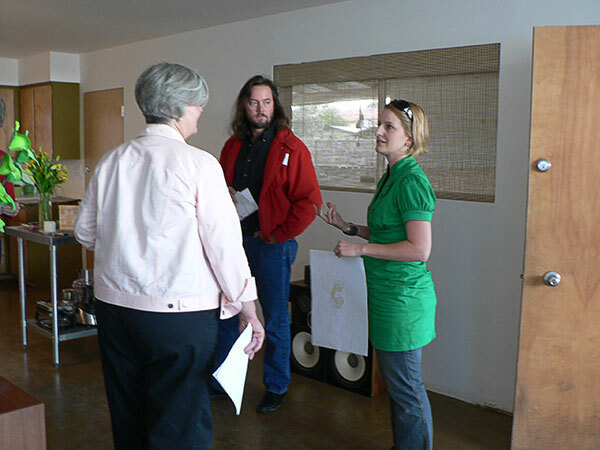 I also organized several entrepreneurs in the neighborhood to participate in the Modern Phoenix Expo. Hector Acuna, Designer/Illustrator made us a super cool presentation board. Mercedes de Oro represented real estate, Scott Osteen represented Architecture, and I represented SKY marketing/branding. It created a nice buzz at the Expo, but more importantly it gave us a sense of identity and collective focus. Town and Country’s 50th Birthday spawned the real beginning of the Haver Hive. We started quarterly neighborhood meetings that dealt with issues from preserving the architectural uniqueness of our mid-century homes to security. One year later, the real estate bubble burst, real estate prices came crashing down and the exodus began. Folks who could not keep up with their mortgages started to leave. Others who bought at the height of the wave walked away because they were underwater. To my surprise the people who bought Haver Homes because of their interest in Mid Century Modern design were among the first to let go. It seemed to me that many of the multi-cultural and multi-generational families stayed. During the course of 3 years we saw dozens leave while the rest of us hunkered down, wondering how long this downward trend was going to continue. The Haver Hive stopped meeting and everyone went in their own direction, disbanding any sense of community that we generated. As we weathered this difficult spell, a new wave of people started to buy homes at low prices. Rather than just flip them, they renovated them to live in. Soon we had over ten families bringing new energy to the Haver Hive. 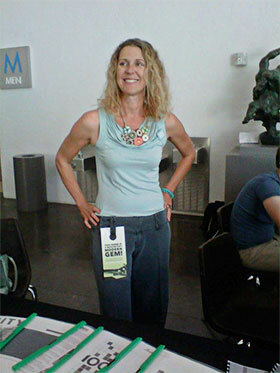 After volunteering at Modern Phoenix Week in 2012, I became re-energized. Lots had changed since our little neighborhood tour—they sold 900 tickets to their annual home tour in less than two weeks. Every event I attended was packed. I was curious why that excitement had not translated to our neighborhood. I sent out an email to some of the new people who moved in, along with others who remained, inviting them to our first Haver Hive meeting in years. Over 17 people showed up, and there was a buzz of excitement as people mingled and introduced each other for the first time. I asked each neighbor to propose one thing we could do to improve the neighborhood. It was interesting to hear the issues present on each street. Neighbors gather for an impropmtu barbecue. Even more remarkable was that the conversation didn’t focus on how to make our neighborhood a mid century showplace. Instead, people expressed the desire to cultivate a real sense of community. Scott Osteen said it best, "not everyone who lives in our neighborhood cares about Haver or mid century design as we do, but we want everyone to feel like they belong. How can we make that happen?" I was truly moved by his statement and thought, “I need to get off my Haver high horse!” It was clear that after this Great Recession many of us realized that making this neighborhood coalesce wasn’t going to hinge on having a perfectly renovated Haver. Rather, it is the feeling of respect, acceptance, trust and belonging with our neighbors that will make the difference. A preoccupation with the right modern aesthetic shifted into a collective effort to improve the neighborhood. For the first time in years I felt a real sense of optimism and hope about what could emerge from this spirit. Now if someone new moves in I bring over a welcome basket or knock on the door instead of calling city services. We just launched a Facebook Fan page—Rancho Ventura Haver Hive—where we now initiate spontaneous conversations and social activities, share resources and show pictures of the cool things we are doing. We wrote a letter inviting the rest of the Hive to join us. While this is still in progress, we are on our way to getting back that sense of community. To Paul Hawkins’ point, we are now focused on coming together in a new way. We are a prime example of the Story of RE—that neighbors banding together, despite our differences, is the most powerful ingredient of real recovery, renewal and building True Community.